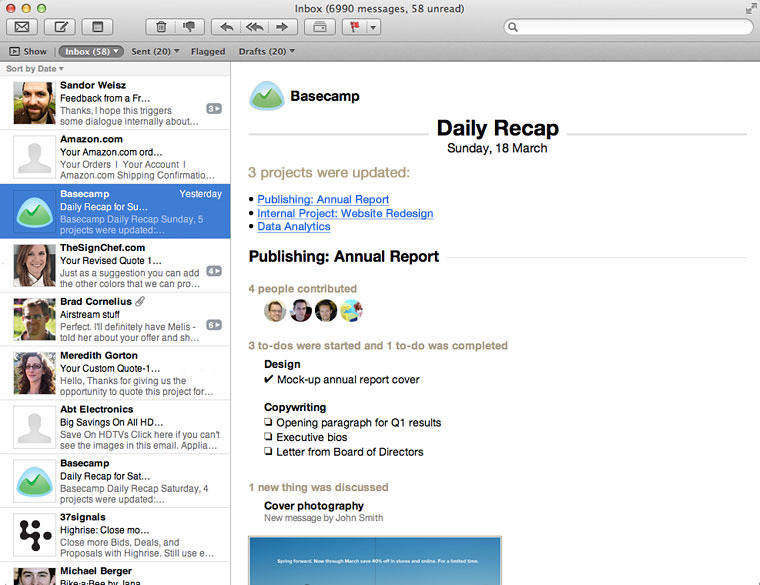 Basecamp software has emerged out to be one of the leading project management tools in the market. Basecamp facilitates effective communication with clients as well as team members thus eliminating the chances of any kind of miscommunication. This software enables easy collaboration of projects, managing and sharing documents, planning, and scheduling. It provides a customizable to-do list where one’s concerned tasks can be noted down in order to prevent the incompletion of that concerned task. Basecamp has an assigned discussion area where questions can be asked and opinions can be shared. With the help of basecamp’s excellent search tool, one can conveniently find his/her lost files or documents. Also with the help of basecamp’s trash can, a team member can easily restore his/her accidentally deleted important files. Teamwork Projects is an intuitive online teamwork and project management application holding the capacity to support high performances and provides ultimate productivity. A very optimum feature which Teamwork provides is the central file storage system which allows access to all of your files from a central location. Teamwork provides the milestone management facility which helps in keeping everyone involved in the project up to date. Teamwork provides email integration feature which allows simultaneous communication within the application via email. Along with communication, one can also create projects and tasks through email. Teamwork provides some excellent collaboration features such as messages and sharable notes. Teamwork supports file integration with Dropbox and Google drive in which you can link documents to your projects. Active Collab is a powerful project management application which facilitates client dealing, resource allocation, time tracking, task organization, and management. It provides complete file control, task filtration, payment tracking and more. Active Collab is available for a cloud service with a monthly payment tiered by the number of users and with unlimited projects. Active Collab has a Gantt-like timeline and a kanban column view which allows users to be one step ahead of their deadlines. One of the standout features of Active Collab is the invoicing feature. Active Collab allows payments using Stripe, PayPal, Authorize.net and Braintree gateways. It also provides efficient collaboration features such as discussions, assignments, file sharing and collaborative writing for which it relies on email rather than chat. Zoho Projects provides a wide range of features like presentations, databases, spreadsheets, bug tracking, project management, invoicing, and web conferencing. The bug tracking feature possesses an impressive interface thus making bug tracking very convenient. Zoho Projects enhances project management oriented tools and makes project planning much easier. It allows members to organize projects, manage and customize tasks and assign priorities. Huddle’s project management software is a web-based team collaborating platforms which comes with an adoption guarantee in which the user will be refunded for the paid three months if the organization does not completely adopt the software after 90 days. user’s tasks and project data. Huddle has version control which allows the upload of multiple versions of the same file and at the same time, it keeps track of the concerned files in the system. 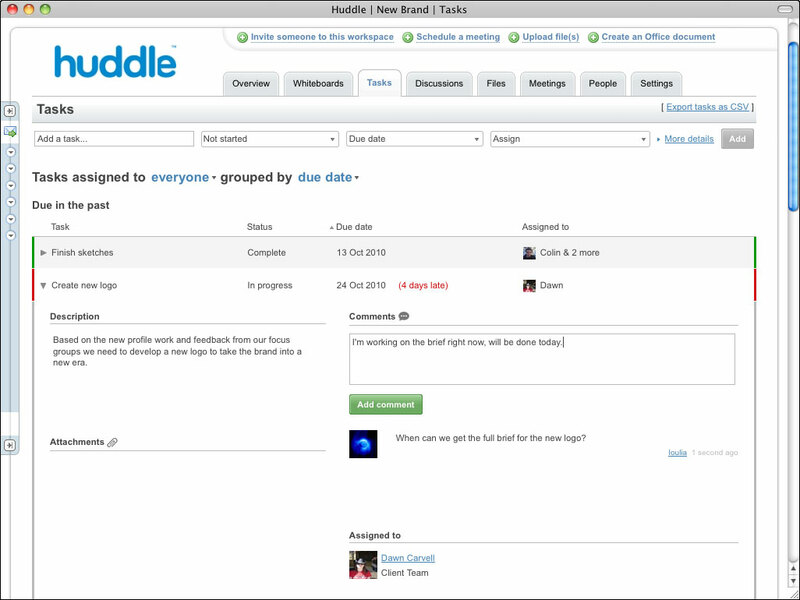 Huddle allows a user to add up to five custom fields per task which helps him/her to track the required information. Huddle enables users to eliminate extra cluttering by allowing them to customize the features provided to them in their workspace. Comment entry and document data are delivered through a mobile device which allows convenient track of the team’s progress and optimum team communication. Podio is used extensively by various organizations for a wide range of purposes. Podio provides flexible project management, collaborates with social and mobile in real time to enhance the team’s focusing power and time management skills. Through instant messaging and video chat, Podio helps in establishing effective communication which ultimately saves time. Podio possesses a unique feature of transforming into a CRM system. Podio’s interactive interface provides a customisable view of work i.e. users can customize as well as improvise their work tools according to their convenience. Podio provides file storage integration with Dropbox, Google Drive, ShareFile and One Drive. Freedcamp is another web-based project management tool and collaboration service developed for single and multiple users which provides budget management, collaboration, agile project management, resource management and project management functionality for small/medium businesses. Freedcamp’s key functional area is task management. In Freedcamp, there is no limit to the number of users as well as the number of projects one can work on. It also provides 200mb of free storage. Freedcamp offers capabilities like Wikis, Invoice management, Templates and Issue tracking as add-ons for a small charge. Freedcamp’s setup is fast, easy and provides the user with the tools and features needed to improve workflow. The software reduces excess clustering by simplifying the way the user looks at his/her projects via the Calendar feature. This Calendar feature can be synced with Google Calendar. Asana is currently one of the most popular projects management software in the market and is well known for improving team collaboration and communication. Asana allows its users to create tasks within the projects, and keep track of the progress of those tasks through the various browser and devices for both iOS and Android. 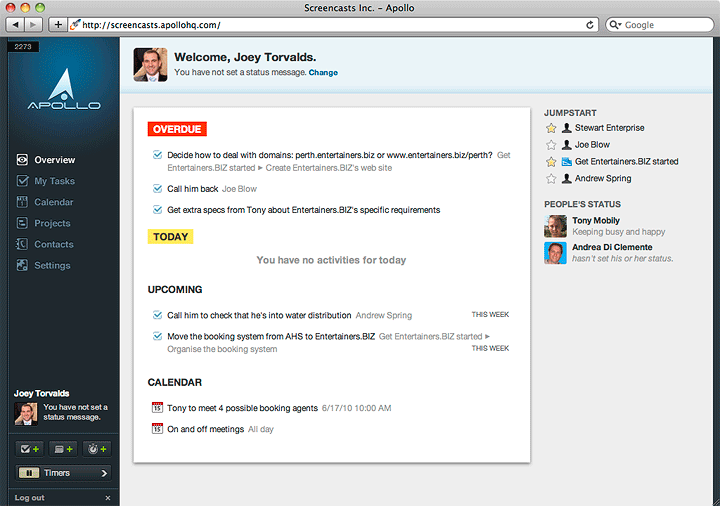 Asana eliminates the need to use email and third-party apps for co-operating communication. The platform provided by Asana enables its users to create, categorize and schedule projects in an allotted special calendar, and improve concentration through the outstanding Focus mode feature. 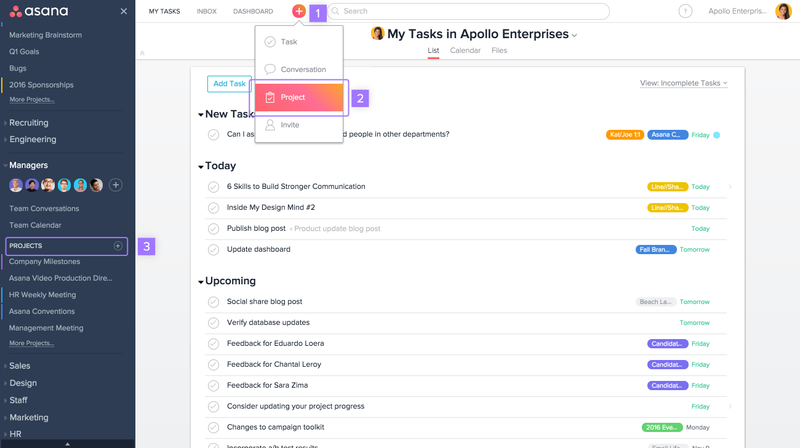 A very attractive feature which Asana provides is the smart inbox in which the user will only receive important task updates instead of unwanted messages. Just like the other project management software, Asana also has a well-established integration setup with essential systems such as Google Drive, Dropbox, Slack, WordPress and many others. Apollo is an online project management software which allows its users to integrate their working and personal life. This software provides easy storage, accessibility, and navigation of project files. Apollo allows the organization and customisation of projects in categories. Apollo enables other people to have access to your data while at the same time preserving integrity and privacy of your information. This feature comes into use when two or more parties are required to share information for mutual cooperative benefits. Apollo provides a reliable customer support. It is open to user opinions, ideas and suggestions through which it can make the work platform better and more suitable for the users. Lighthouse is a web-based project management application meant to help teams of any size in conveniently tracking their project development. This project management tool simplifies workflow through collaboration and collection of valuable feedback with everyone involved i.e. within the team or the public. Lighthouse allows customization as well as integration through its centralized document management and API which enables the application to expand its functionality for being adopted seamlessly by teams and organizations with existing workflows. Lighthouse issue tracking is designed to provide the user with an intuitive screen which allows quick adoption through features like advanced search and saved searches called ticket bins. Lighthouse provides powerful issue and project tracking. Some other features of Lighthouse include email integration and automatic task organization. There is a wide variety of project management software available in the market, each one of them having their own unique features. These unique features come in handy to different people at different time. Thus, a user must choose the software which will enable him/her to enhance his/her workflow, time management skills and overall work efficiency.